I borrowed this book from the library a while back but didn’t get to it in time and had to return it because someone put a hold on it. When The Kitchen Reader chose it as their monthly pick I was excited to borrow it again. I’ve only read one graphic novel before and didn’t really like it so I wondered if I’d like this or not. I did. It was interesting right from the first paragraph and not once did I lose interest. I liked following the author through her childhood and reading all about her relationship with her mom and dad, and friends. Both of her parents sound awesome and she seemed to adjust to change very well. I could relate to the fact that food triggers memories, because it does for me too. One of my favorite stories was the one where Lucy and her friend Nelly backpacked through Europe. The part about her and the croissants she found in a tiny bakery in Venice was really funny. Another one I loved was when Lucy and her mom and her friend Drew, his mom and sister went to Mexico. I don’t want to add any spoilers, but believe me, Lucy and Drew had quite the adventure. And then some! The story didn’t really include Drew’s sister Mason so I was wondering where she was the whole time Lucy and Drew were exploring the city. The graphics are adorable, colorful and clear, and there are recipes included in the book. That’s always a plus for me. The book is a quick read, it only took me about an hour to read it so it’s great for anyone who likes shorter books, or when you find yourself with an hour or two to spare. 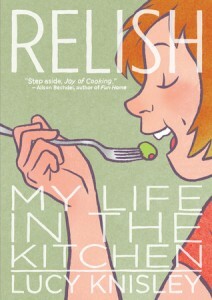 Lucy Knisley is a really good author and illustrator and I loved Relish. I definitely want to read more of her books. I can’t believe I haven’t read this yet. It’s still on my list, looks like a good book but I have been devouring my Inspector Banks books lately. I too loved this book. I read all four of Knisley’s graphic memoirs and it’s interesting to see her mature. Yay! Glad you loved this! Funny because I was just talking to someone about her travel in books but I totally forgot that this one had a bit of travel as well. Discovering foods and eating out is one of my favorite things about travel, too. I thoroughly enjoyed this one though like you I was a bit hesitant going into it. There were just so many great stories and it really just made me want to eat – especially pastries! I know! My mind keeps trying to get me to eat one. Yay, I’ve read a bunch of her stuff – latest one Displacement – all fabulous! The other graphic author I like is Maira Kalman. Cheers from Carole’s Chatter! I never heard of this one but it does sound good. 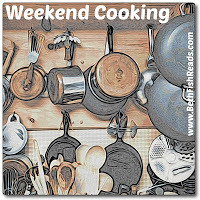 I really need to read this and the other one I’ve heard about through Weekend Cooking! (something with Milk in the title?)! French Milk is the name of the book Laurie. I hope you do read them and that you love them as much as I loved Relish. I’ll be reading French Milk as soon as I can. One of the things I liked was that her style of storytelling was detailed, humorous, but also humble. It makes her seem charming like a friend I want to have! I am going to try to borrow the other books from the library too!